Dorcas was baptised at Probus, Cornwall on 3rd August 1786. She grew up on the family farm at Barteliva and Carvosso in Probus. The engagement to Captain Temple was not welcomed by the parents. “The young officer, bred in a different home atmosphere must have seemed an incongruous addition to the strict and old fashioned Cornish family”. They had no love for the army; the war taxes pressed the landowners very severely. Richard (father) forbade the banns - "I will have no soldiers in my family" is attributed to him - however, they married on 8th July 1805 in Probus. Nicholas Carveth, her elder brother, and Catherine, a younger sister, were witnesses. 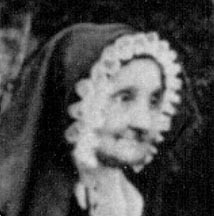 Jennetta Octavia, a daughter, wrote in 1888 " My mother was considered a beautiful woman, with gentle manners, knowing no language but her own, not clever in the sense of brilliant at all, but thoughtful, with excellent judgement, great sense of personal dignity, governing her family without any effort, without severity. Her word was an unquestioned law ...... She was the only teacher that we had until we went to school. She taught us to read and write; she taught arithmetic, with very little knowledge of arithmetic herself, by steady repetition ....... When it was time for my brothers to learn Latin, the same system was adopted". According to the 1841 Census, Dorcas was living her dsughter Stowe and her husband Dr William Henry Hugo at Oxon House, Culmstock, Devon. Also present were two of her other daughters, Catherine and Jennatta. Plus a visitor and many staff. She died at Rugby School where Frederick was, in 1866, Headmaster and was buried in Rugby cemetery. The source for this information is the book "Frederick Temple, Archbishop of Canterbury." Published by MacMillan & Co in1906.